Antoine Germany is a veteran teacher at Luther Burbank High School in Sacramento and is Chair of the English Department. The recent shooting of Stephon Clark, a 22 year old, unarmed black man by law enforcement has engendered questions, outrage and sadness nationally. This tragedy especially affects the Luther Burbank High School community because the shooting took place merely a mile away from our campus. Although the investigation is ongoing many of our students have shared their anxieties and have expressed strong opinions. Some of our students have even participated in protests that have garnered national attention. As an educator what can I do to facilitate a conversation with my students about this tragedy without falling into the pit of political advocacy? Community Circles: In my class we had a discussion about our interactions with law enforcement. I shared my perspective of law enforcement and the few incidents I’ve had with police officers. Students were asked to share their experiences and perspectives in a respectful manner. They were also asked to reflect on how their perspectives were shaped. Was their view of police officers shaped by experience, family, music, media, or social media? Students had many thoughtful ideas and were given an opportunity to learn from each other. Writing as problem Solvers: Instead of focusing on who is to blame I had students write about ways to reduce or eliminate the shooting of unarmed citizens. Students had many interesting ideas including an increase of community policing (police living in the area that they police), nonlethal equipment for officers and more minorities in law enforcement. Critical Thinking through Outrage: In an effort to have students critically think I asked students do they believe protest like the ones many of them participated in was an outlet for them to express their outrage or was it their attempt to bring about change. Of course this is not a binary choice and students were expressing outrage and protesting for change but the conversation led many students to think of ways to more effectively bring about changes. Students expressed an interest in civic participation beyond protest like running for office or volunteering in their communities. 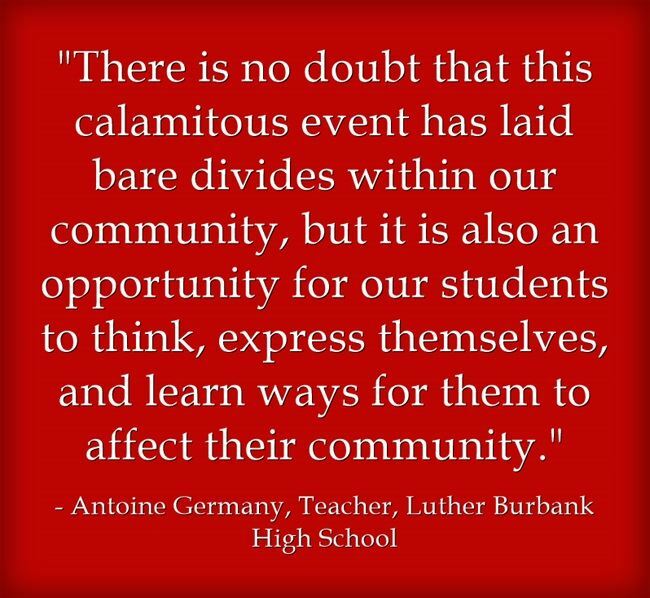 There is no doubt that this calamitous event has laid bare divides within our community, but it is also an opportunity for our students to think, express themselves, and learn ways for them to affect their community. 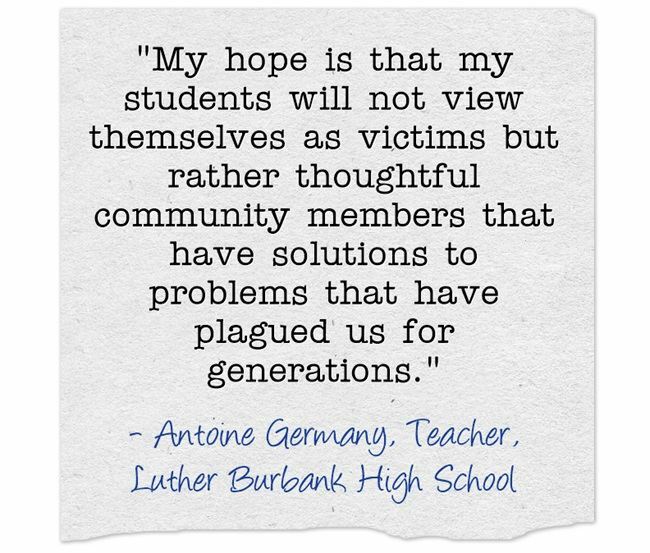 My hope is that my students will not view themselves as victims but rather thoughtful community members that have solutions to problems that have plagued us for generations.